When Stripes Group, a private equity firm in Manhattan, was preparing for a move from their old office in Midtown to a cool new spot in the Meatpacking District, they told the design team at ICRAVE that they wanted an open office that would “promote the free flow of ideas.” But in the open space, they also wanted to integrate six private offices for their top executives. Read on for an interview with the project manager, Mitchell Streichhirsch, to find out how the designers struck a balance between private and communal space in order to maximize connections between floors and among employees. All photos by John Muggenborg, courtesy of ICRAVE. The new office occupies three floors, which divide various programmatic elements – from private executive offices to communal meeting spaces – with special attention paid to inter-connectivity to foster more employee interaction. Completed last June, the space clocks in at 6,600 square feet and is now home to twenty-five Stripes employees (and two Stripes dogs). All photos by John Muggenborg. What was the old Stripes Group office like and how is the new one different? The old office was unoriginal with minimal lighting, inter-connectivity, and space. The new office is in a newly constructed and freshly designed building in the Meatpacking District, which appeals to their client base of cutting edge consumer product companies such as Art.com and Seamless. To simultaneously provide privacy and foster collaboration, the new office utilizes three spacious floors, divided for private executive offices, communal meeting spaces, and general workspace. It is also much brighter with more windows for natural light, and features custom touches like reclaimed wood panels from old New York City water towers, or a “plant-like” green fixture made by Vitra in the reception area. How did you strike a balance between designing something new and open but also designing something that caters to a business that deals with privileged information, and wanted to keep a few of those private offices? We used sliding glass doors for executive offices, [which allow for] confidentiality during meetings, but simultaneously the transparency encourages employees to come and go freely. We also took the different programs that go into the work day and broke them up into unique areas. In practical terms, it meant assigning each floor a particular function. For example, the third floor houses the bullpen area, a youthful and energetic open floor plan space where the younger members of the staff are within eye and earshot of one another to toss around ideas. We hung custom bikes on the walls and the carpet tiles have a bold, dynamic pattern. Acoustical panels hang from airport cables and tubular lights run in the channels between. The fourth floor is the main public zone geared towards visitors and clients. This is where guests get off the elevator and are met by the receptionist. There are two conference rooms on the north side and three private rooms where the presentations are given or the deals are made. There had to be some semblance of seriousness in this particular area. We left the concrete floor exposed and polished it. It creates a feeling of raw space and lent some history of the neighborhood to it. Work by Leroy Granisand and Hans Van Der Meer hangs throughout, and the furnishings mix contemporary pieces with a few mid-century modern pieces to play off the more industrial elements. The reclaimed wood from old New York City water towers is also very prominent on this floor, and also wraps into the catering kitchen. The fifth floor holds six private, executive offices and a dramatic installation of tubular fluorescent lights, one of the first in North America to include the product. The reclaimed wood is carried through to this floor and connects the two managing partners offices book-ended on the north and south. There was a more conscious attempt to make this floor feel more luxurious, but it was done thoughtfully and purposefully with give the feeling that someone special is happening in this office. How has the new office shifted the culture and employee experience at Stripes Group? With an open floor plan on all three floors, glass office fronts, and communal meeting spaces on each floor, there’s a greater sense of inter-connectivity between employees. 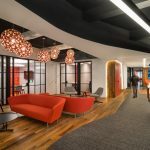 At first, the three floors appeared to be a design challenge in regards to creating a more connected and collaborative environment. However, in the end it helped us to stray away from typical office layouts and find creative ways to blur the lines between design elements. Let’s talk acoustics: did you make any moves to help limit noise across the open plan? Yes. Since the floor plan is quite open and incorporates hard surfaces with polished concrete floors and reclaimed wood on the walls, custom-dyed Persian rugs are featured in each office to compliment the artwork and absorb the daily office noise. In addition, on the third floor we hung an array of acoustical panels on the ceiling from aircraft cables, which also makes an interesting visual pattern and holds linear lighting that runs north and south in the gaps between panels. On top of everything else, the space just looks good. How did you choose furnishings and materials to achieve this great “feel”? Many of the materials and furniture selections reflect the heritage of the Meatpacking District and surrounding neighborhood. However, the challenge was to take this brand new building and three-floor space and create the illusion that Stripes Group had occupied the office for years. This is why the concrete floors were left exposed and just polished, or the custom painted graphics on the floor bleed from the entry hallway under glass walls and into conference rooms or private offices. We sought to juxtapose raw materials by selecting vintage, mid-century modern furniture pieces that would provide a clean, crisp look mixed with the industrial vibe of the space. The biggest materialistic move is the reclaimed wood repeated on each floor as though it’s the material connecting the entire space. We wanted their new office to be bright and — [totally unlike] their old, dark, stodgy space. The office is designed with environmentally responsible materials like reclaimed wood and strong LED lighting fixtures. We also wanted the company’s employees to feel comfortable in their work environment, so we integrated custom touches to make the office feel more fun. Unusual design elements for a private equity firm can be found at Stripes Group: bikes with the company logo placed on the walls, over-dyed Persian rugs, and a “plant-like” green fixture near the reception desk are a few favorites. Architect of Record: Anthony Mrkic Architect Inc.